The loss of a loved one is a difficult time for all as, although it is sad, it is natural to grieve and Edinburgh flowers wants to help as much as possible when it comes to the funeral ceremony so you don’t have to worry over trivial matters. 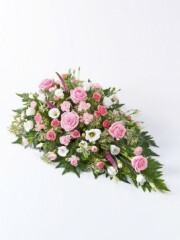 We want to assure you that all the flowers used in the funeral sprays and sheaves are of the best quality as the Edinburgh florists only work with flowers that have been imported all the way from Holland. Holland is the western region of the Netherlands know for its prosperous fields which produce some of the best flowers in the world. Not only that but combined with up to four deliveries per week from the Dutch cultivators, our flowers are also the freshest with a high longevity which means that your arrangement will stay fresh and beautiful throughout the funeral ceremony. The selection of sprays and sheaves on offer are vibrant and colourful in order to make the ceremony as beautiful as it can be in order to honour the memory of your loved one. The florists work with flowers like traditional roses; elegant calla lilies amongst other types; irises; lovely carnations; beautiful chrysanthemums; lisianthus; alstroemeria as well as many others as the Dutch cultivators provide them with a huge selection. If you have any further questions about any of the services provided at Edinburgh flowers or if you would like to book a consultation, please don’t hesitate to get in touch. You are able to reach Edinburgh flowers both by email or by phone as well as popping into the store as there is always a member of the Edinburgh flowers team ready and available to answer all of your questions. Once your order has been placed, all customers have the choice to use one of the several flower delivery services on offer at Edinburgh flowers. This means that you do not have to personally collect and deliver the flowers to the venue as we take care of everything for you which comes in handy if several arrangements have been order or if you are struggling during such a difficult time. There are three primary flower delivery services available which are the standard, next day and same day flower delivery services. All of these are available between the hours of 9:00AM and 5:30PM, six days a week Monday to Saturday. Exceptions are sometimes made and deliveries are made possible on Sundays for occasions like funerals. The next day flower delivery service is allows you to place an order and have it delivered the next day so everything is taken care of for you within the space of two days. The same day flower delivery allows you to place your order on the actual delivery date which means that the Edinburgh florists work very efficiently and within a short time frame. Please note that in order to use the same day flower delivery service, your order must be placed before 3PM to give the florists enough time to arrange your order to the shop’s best standards. Edinburgh florists have over forty years of experience in the floristry industry which sadly also means they have catered for many funeral in the past. You can be rest assured that the quality of service you will be provided by Edinburgh flowers is nothing short of perfection and we are here to help in any way possible.